Being a professor comes with a few perks - for example, for me, having an office in a prominent spot on a floor of the Desmarais Building at the University of Ottawa that houses the Information Studies and Communication departments. There is space to post things on the outside of my door. Many professors have posters about conferences that they are involved with, for example. Which gets me to my New Year's wish - an open source poster to promote open access in these disciplines. It should be possible to build on some of the excellent work on promotional materials such as open access logos developed for open access week. How about a link to the DOAJ subject lists for these areas, the Social Sciences Research Network, E-LIS and PubMed (all relevant to faculty members in these areas). A customizable poster would be optimal. For example, the institutional repository could be an example, for everyone to look up and substitute their own. People in different disciplines could switch to more relevant DOAJ lists and subject repositories. If the poster were manipulable, then people could add information of local interest, such as journals we or our colleagues are involved in. A list of bullet points on why open access could be provided, with individuals selecting what is most likely to speak to people locally. This is just a wish! Given the time of year, projects for next year's OA Week may be more feasible. Please join us in boycotting Elsevier at The Cost of Knowledge website. Thanks to Tyler Nelson for creating and updating the site. Elsevier has bought two publishers of my works, including the publisher of my book (Chandos / Woodhead). I'm debating adding a clause to future publishing contracts that states no selling my work to Elsevier. If anyone from Elsevier is reading this, please remove me from your Elsevier "Author Connect" list. I an not an Elsevier author, and I do not wish to connect. Second update: ownership of a work by a publisher that I am on the record as boycotting is in fundamental conflict with my moral rights as an author. Chandos published a number of books on open access, and other authors may have the same perspective. Update December 22: my original blogpost on joining the Cost of Knowledge boycott can be found here. One upside of this sale is that it provides an excellent example of how copyright ownership can be completely divorced from, and often counter to, creativity. My book Scholarly Communication for Librarians is the result of a great deal of hard work on my part and inspiration and comments from many others, who are listed in the acknowledgements. The contributions of Glyn Jones and the staff at Chandos were significant. Elsevier contributed absolutely nothing to the creative work involved with this book; this company simply holds the ownership to extract rent from sale of the book. This method of dissemination - no dissemination without paying a toll to this company - impedes the dissemination that is necessary to advance scholarly knowledge. Elsevier's ownership of the IP for this book is an impediment to updating it. If instead of writing a book in this way I had created a wiki, I would have had a tool that anyone, anywhere could access, one that I could update easily. I would have had a textbook that I could have asked my students to read (I never required this for the published version as the price to me was outrageoues). No worries, dear reader - as you probably realize, a book a scholarly communication dated 2009 is substantially out of date. Next book I write will be much more like a wiki than a traditional book. Thanks to Peter Suber - major and most welcome OA news from the EU! Noteworthy: 8 university libraries across will welcome articles from researchers at other universities to facilitate adoption of this policy! Noteworthy: ACOA / APLAC's final recommendation is to eliminate the open access publishing option as part of the policy. Researchers should deposit in a Canadian-based open access archive whether they publish with an open access or toll access journal. 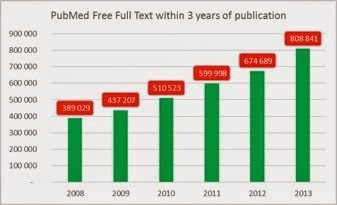 As shown in this chart (thanks to César Villamizar), the number of articles indexed in PubMed for which free fulltext is available within 3 years of publication is now over 800,000, or 28% of the articles indexed. This growth is an important indication of the dramatic growth of high quality open access resources. The U.S. National Institutes of Health, responsible for the PubMed index, does not index junk! Recently Peter Gruss, President of the Max Planck Society wrote about the unstoppable rise of open access. The 2013 early year-end edition of the Dramatic Growth of Open Access confirms this unstoppable rise, featuring a number of notable areas of growth and important milestones, with a focus on numbers that are indicators of growth of high quality open access resources. Congratulations are due to the Public Library of Science as recently PLoS celebrated a milestone of its 100,000th article. The number of journals actively participating in PubMedCentral continues to rise. In the past year, the number of journals actively participating in PMC increased by 215 - about one title per working day. There are now more than 1,000 journals in PMC with all articles open access. The number of research funding agencies and institutions with open access mandates continues to rise. 12 more institutional open access mandates have been added to ROARMAP since September 30th! Mandates by funding agencies and prestigious research institutions and universities ensure that the growth of open access features high quality articles, due to the vetting processes involved in assessing funding grant requests and institutional hiring, tenure and promotion practices. Congratulations to the Directory of Open Access Journals for passing another very recent milestone of 10 thousand titles! Due to continuous improvement DOAJ was deleting as many titles as it was adding earlier this year - for this reason, the growth in DOAJ reflects not only quantity but quality as poorer journals have been weeded. Dramatic as the growth of open access has been to date, it looks like we can count on a ramping up of growth in 2014, when the first discipline-wide transition to open access, in particle physics, is implemented as SCOAP3 is set to begin January 1, 2014. Internet Archive continues to amaze, having added 1.8 million texts this past year for a total of more than 5 million texts! A special thank you to César Villamizar, a student in our School of Information Studies and research assistant, for help with this issue's data and charts - and a well-deserved Happy Holidays and New Year to everyone in the open access movement! The full data and chart are available to download from uO recherche. This post is part of the Dramatic Growth of Open Access series.